While I've always used my fingers and/or a wooden popsicle stick to compress piston rings when fitting the cylinder to the piston, you may prefer a dedicated tool. Many of the automotive tools are far too tall and unwieldy for our application. My 650 cc Ural with high compression pistons has very fragile oil rings. I used a ring compressor for car engines as base to build my own tool. My antique sheet-iron shears did cut the thin hardened sheet metal very easily like paper. 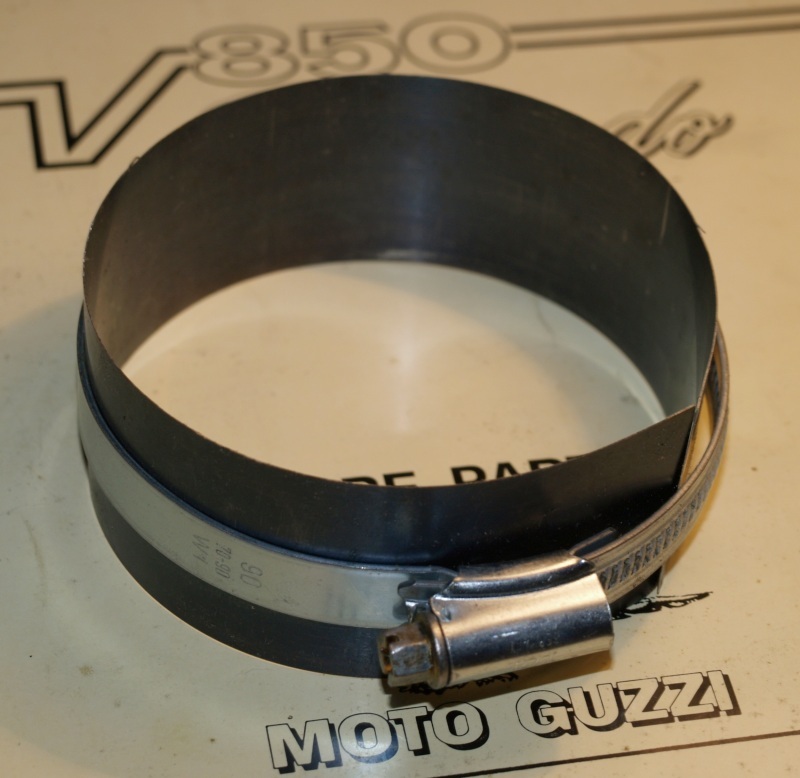 The tool did also work with great success on new 83 mm Guzzi pistons for the 850 cc engines. Photo courtesy of Ralf Brinkmann. A variation on Ralf's piston ring compression tool. I was worried about the shim material scraping on the piston, So I cut a 1 inch section of 4 inch diameter plastic duct pipe. cleaned the cut edge with a blade, and snipped off a section of the circle about 21⁄2 inch until it went around the piston with no gap. The plastic is soft but strong enough to shepherd the rings. Cylinder went on with a gentle push. As a bonus it is already formed into a curve almost the correct size - little bending needed.